Each month, we’ll be diving into The Beacon archive and sharing an interesting article from the last 100 years of the magazine. It felt fitting that the first article we publish from the archive be from the January edition in 1917. It is called ‘Yesterday and Today at St Dunstan’s’. Joan Kennedy, the author of the article, wrote a romantic account of her visit to the convalescent home and the soldiers who stayed there. ‘It was a day of grey and cold when I found my way to St Dunstan’s, the Workshop of Darkness that forms a training home for the blind brave. A November haze hung over the splendid mansion that has so often been called the Palace of Hope, and the last golden leaves of Autumn’s splendour were fluttering to the ground. Behind me stood a house of many historical associations; before me swept green lawns and many paths, little shrubberies and railed ways, workshops continually growing as more and more men were admitted for training – fifteen acres of goodly heritage handed over to Sir Arthur Pearson that the boys who have given nature’s most precious gift in the service of King and country might be trained in comfort to meet their darkened futures. But this beautiful home in the centre of the Big Smoke is more than a training ground for the hands and brains of its inmates. It is there that men find the inner light which helps the sightless one to bear his cross. The men of St Dunstan’s learn patience, perseverance, and gain peace. Many thoughts come crowding as you wander through the Workshop of Darkness. Romance of the past follows your footsteps down to where a silvery gleam indicates the arm of the Regent’s Park lake, which runs into the grounds. Looking back you see the terraces crowned by a white mansion; you hear taping sticks as the inmates take exercise by walking round the grounds, and the wonder of it all is more insistent than the tragedy. Little pictures from the past flicker across your brain. St Dunstan’s, built in the splendid days of the Regency, by the third Marquess of Hertford, the “Steyne” of “Vanity Fair”, is a place for reviving pictures. Did Becky Sharp ever trip down the circular steps to where the old mulberry tree stands on the lawn? Did her white fingers ever gather the glowing fruits that ripen every summer on its gnarled boughs? How many ladies in stiff brocades, with elaborate tortoiseshell combs in their tresses, have acted their charades or danced their minuets in the big ballroom, with its tent-shaped dome which marks the centre of the building? How many handsomely cravatted squires have drunk wine with the wicked old Marquess whose home this once was? Drawing nearer to the mansion again we see the huge clock that decorates the exterior. It is one of the inanimate things at St Dunstan’s. Gog and Magog, the giants, stand ready with their hammers to sound the bells that tell the hour, but in these days of war their energies are restrained by strong wires. Once upon a time the clock graces the church of St Dunstan’s in the West, and when the Marquess was a good boy his nurse used to take him to see the giants strike the hour. When he built his villa he brought the clock and set it up where it now stands, naming his house St Dunstan’s. In those days there was another important ornament in the building – “The Vision of St Helena,” by Veronese, which is now in the National Gallery. The picture of St Dunstan’s in the past bears no comparison with the life one sees there today. In the grand ballroom, where once royalty looked on at the dance, the little boxes still whisper of past splendours, but they are as nothing to the splendour of the present – the splendour of achievement. You go to the Workshop of Darkness expecting doom and depression. You come away impressed by its cheerfulness. So much has been written of this home and its inmates, but much might still be written, and the subject would not grow threadbare. With every passing month the work accomplished grows in interest as it grows in perfection. A man has a choice of many trades when he enters this hostel for blind warriors, and it is through the workshop that he finds himself. If his taste inclines to the handling of wood, he enters the carpenter’s shop, and he soon becomes adept in the making of the scores of articles that are needed in the home, from a soap drainer to a pair of steps. If cobblery attracts, there are blind instructors to initiate him into the business of boot-repairing. Several of St Dunstan’s pupils are now in business for themselves, and are earning a steady income of over a pound a week. Then there are such occupations as mat-making, basket-making, netting bags and hammocks, typewriting, poultry farming, and simple market gardening. Most men of superior mental attainments can take up massage, and, once fully trained, be sure of excellent posts in military hospitals. Arrangements have also been made to teach some men to be divers, while yet another good opening lies in telephone operating, which is taught at The National Institute for the Blind. But all work and no play would not be good for any man, so there is a lighted side to the life at St Dunstan’s. Recreation and amusement are provided. There are long walks under the care of voluntary helpers; there is rowing on the lake and swimming in the St Marylebone Baths. 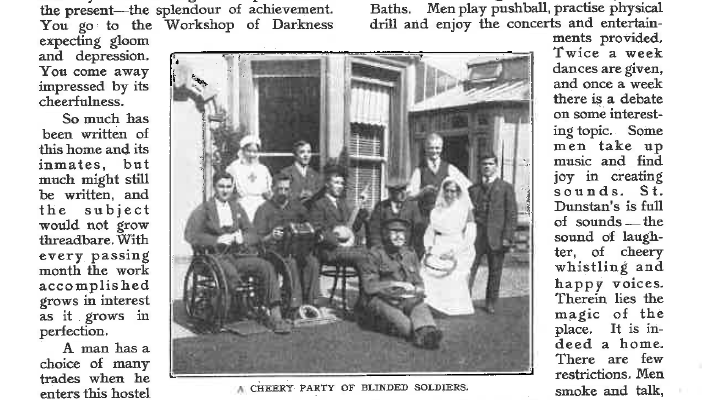 Men play pushball, practise physical drill and enjoy the concerts and entertainments provided. Twice a week dances are given, and once a week there is a debate on some interesting topic. Some men take up music and find joy in creating sounds. St Dunstan’s is full of sounds – the sounds of laughter, of cheery whistling and happy voices. Therein lies the magic of the place. It is indeed a home. There are few restrictions. Men smoke and talk, they receive their friends, they may go out at any time. And there are weddings from the Palace of Hope, when blinded bridegroom and happy bride get the congratulations of the entire household. Contrast the St Dunstan’s of today with the house in the past. Through the splendid rooms wander the men who have given so much through war. They sit down to their meals in the halls which were graced by royalty in another period. Cheerful women of the V.A.D minister to their needs, teach them to be busy, and cheer them when the day of darkness seems long. Surgeons, doctors and dentists ungrudgingly give their services. Some of the foremost men of the day in politics, religion and the arts come to “do their bit” by the words of encouragement. And then there is Sister Pat, the matron, with her trained nurses, to see that the home spirit and general welfare of the men is attended to. The revels of the Regency days sink into insignificance before the spirit that animates the inmates of the mansion today. St Dunstan’s stands for all that is splendid in the world of achievement, and the past is as nothing in the face of the present.